Skate are bottom-dwelling fish that look like a cross between a flounder and a stingray. These fish are a member of the ray family and​ cousin of sharks, with pectoral fins that are so large that they appear to be wings, hence the term "skate wing." Most people never realize the resemblance to a wing, however, as skate wing is usually purchased skinned and filleted. 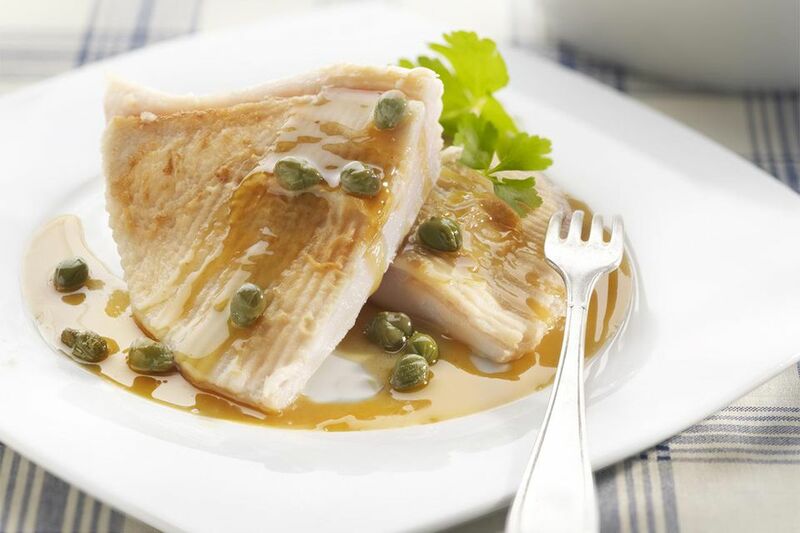 Skate wing has long been a favorite in French cuisine and is becoming increasingly popular with American chefs as they discover its moist mouth-feel and succulent flavor. Saltwater anglers catch lots of skates while looking for other fish, and they are perfectly tasty once you skin them, remove the tough centerline of cartilage, and cook them gently. This French-inspired skate wing with brown butter recipe keeps things simple, but delicious, so the flavor of the skate can truly stand out. Set the oven to warm. Have a baking sheet or oven-safe platter ready for the fish. Remove the skate wings from the refrigerator and salt lightly. Let stand for 15 minutes. Heat a skillet over high heat for 3 minutes. Turn the heat down to medium-high and add 2 tablespoons of butter to the pan. Meanwhile, dredge the skate wings in flour and shake off the excess. Fry in the butter over medium heat, about 2 to 3 minutes per side. Be careful when turning the fish, as their odd muscle structure makes them difficult to flip without breaking. Transfer the skate wings to the baking sheet and place in the warm oven. Add the 2 other tablespoons of butter to the skillet. Cook over medium heat until the butter is a light brown. Keep a close eye on the pan as this will not take too long and you don't want the butter to burn. Add the wine to the skillet (it will splatter, so be careful). Scrape up any bits that may have stuck to the bottom of the pan and cook off the alcohol, about 2 to 3 minutes. Plate the fish and pour the sauce over the skate wings. Garnish with the chives and serve immediately. When butter burns, it turns a dark brown; however, brown butter should be a light brown color. It is important that you stop cooking once the butter begins to change color and not after, or else the dish will be ruined. When making skate wings, be sure not to overcook them or they will become rubbery. You need to cook for only a few minutes until the flesh is opaque and starting to flake. Skate wing with brown butter goes well with simple rice dishes or mashed potatoes, but if you want to keep with the French inspiration why not try a gratin dauphinoise recipe, a rich baked dish of potatoes, milk, cream, egg, and cheese. A nice, white wine is the perfect match for this skate in brown butter. For the perfect wine pairing, try a Sancerre or a Greek Assyrtiko.